Would you rather live in a world where inflation is near zero and recessions rare? Then go, live in the Nineteenth Century. In the last four decades, the world economy has amassed unprecedented prosperity. Between 1970 and 2008, the gross world product rose 400 percent to $62 trillion. However, this period also saw two major energy crises, at least four recessions, two stock market crashes, one currency crisis, the fall of a superpower, national bankruptcies and bouts of hyperinflation. What gives? India’s Independence Day, August 15, perhaps offers a clue. On this day in 1971, the world abandoned any vestige of the gold standard. US President Richard Nixon delinked the dollar from the yellow metal, nixing a 200-year-old practice and ushering in an era of unrestrained printing of the currency. “For the question whether the world’s monetary system has been more prone to financial crisis in the period since the link between the dollar and gold was removed, the empirical answer is, yes,” says Suman K. Bery, director general of National Council of Applied Economic Research (NCAER). But he is quick to add that no direct link has yet been established. Since the dawn of culture, gold has served as a store of value. It was considered essential to back currency with real wealth. 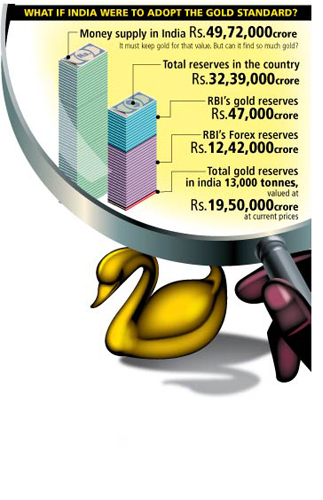 So, treasury heads were allowed to print paper money only to the extent of their gold reserves. During 1879-1914, the classical gold standard era, the average inflation in most countries was less than 1 percent. After 1914, the gold standard was abandoned by most countries. Central bankers wanted to print currency to fund the World Wars and lift their economies from the impact of the Great Depression. So, the US remained the only nation with a gold standard. Under the Bretton Woods system, it also agreed to convert dollars into gold at a fixed rate. This made the dollar the world’s reserve currency. But, this had built up pressure on the US monetary system by the time Nixon became president. France had started converting its dollars to gold. Also, the need to pump in money for the Vietnam war forced Nixon’s hand. The US now no longer stood guarantee to the world’s reserves. The era of monetary expansion had truly begun. Four decades later, there are murmurs that the world should go back to the gold standard to contain economic volatility. But the US is not in a position to keep gold on behalf of everyone in the world. Nor can it afford to control printing of currency, given its economic sluggishness. In fact, there may not be a real need for the gold standard any longer. Experts argue that the flexibility to print currency actually thwarted the risk of the 1987 Wall Street crash from ballooning into a Depression-like crisis. It has also expanded world trade, led to the rise of new economic powers such as China and India and brought legitimacy to paper money. The new gold standard is the central banker’s mind. He/she must regulate money supply as if there is a gold standard.